Hi Eden. I’m not Nostradamus but, like I mentioned in the story, I’m pretty sure they are going to become very popular. Thumbs up on the Sudoku – I do one a day. I don’t get smarter, I just use up time. By the way, since you began writing on the 4th and just published it on the 10th, does that mean you might have been imbibing something stronger than coffee and lost your concentration? Yeah, I started it on the 4th. But I reworked it and tweaked it various times over the following days. That’s pretty much what I always do. A puzzle, yes I’m with you all the way. A fine song, yes I love my music and subscribe to the if music be the food of love stuff etc, ok. Coffee? No can do my friend. Ever tried a nice cup of tea in a morning? Hi Steve. I’m definitely into tea. I have iced tea in the afternoon during warmer days. And in the winter I usually have hot tea at night. The world would be a sadder place without coffee. I might be wrong, but I think that I read that hot coffee first was drunk, centuries ago, in the Middle East. Don’t get in between me and a shot of good coffee! I’m moving out of the way! Always good to find another coffee and Sudoku fan! Glad you liked the story, AOC. I’m always delighted to hear from you. Thanks for sharing your own particular morning routine with us. A fine song by the band you’ve just introduced us to as well – You are lucky to have that local radio station. The link works! What a small world we live in. The radio station I usually tune in to is going through a few big changes at the moment (which I’m not happy with) so this could be an interesting alternative! The morning coffee is a permanent American concern, it seems, and from an across the Atlantic perspective it has become almost a cartoon comic icon of the States. With such interest it always puzzled me why, in the name of god, there seems to be such difficulty in making the “good cup of coffee”. In a country of tea drinkers we are firmly coffee drinkers – my wife’s grandaunt and her husband lived for many years in New York before retiring home to Ireland. They brought the love of coffee with them – and blue cheese…nobody would have dreamed of eating mouldy cheese here before they arrived! Bewleys is a coffee shop/cafe/restaurant in Dublin, our capital city, and they market their own brand of ground coffee. We have used it for years and, though we have tried other brands, have never found another to our enjoyment. I compare your morning routine to mine and am glad I have a few more strands than you. Rising so early strikes me as unnatural, certainly against my nature but we must ….. here comes two year old grandson to be minded for the day! That’s how my day is going! It’s an Irish company and I doubt if they export to the States. You’ll have to visit! Now I need a coffee! You know, I’ve read that per capita coffee consumption is far higher in some countries that don’t grow coffee, as opposed to those countries where it’s grown (Ethiopia, Brazil, and others). I think I saw in an article that Finland has the highest per capita consumption in the world. Morning coffee – yes. Manna from heaven. I have only one a day and it better be hot, fresh, and strong. For reasons I can’t explain, this morning’s coffee – the exact same brew as yesterday – is missing the mark. I think it may be one of ‘those’ days. After coffee, there is no routine. My days tend to be anything goes. Hi Joanne. I’ve also noticed that on some days the coffee comes out a little stronger than on others. I think it has to do with the mood that my Mr. Coffee machine is in! Your coffee sounds delicious . …l can almost smell it! Give the recipe a try. It’s real good (to me and Sandy, anyway). Right, most of us need caffeine I think. It makes the body run better! Being perverse, we live in Costa Rica and drink tea to start the day…. Tea is a good way to greet the morning. There probably are more tea drinkers in the world than coffee drinkers. Yeah, I suppose that pretty much everyone develops strong, recurring activity patterns. It’s hard not to. Hi there, Deb. Please don’t sue me if it doesn’t work out! The only reason I show up at work is for the coffee. It’s not very good (Folger’s), but it’s free. Have a great rest of the week, Pete. I do NOT understand why WordPress will not allow me to “like” posts on your blog, dammit. I’m logged in and everything. Dammit. Anyway, bless Sandy for paying homage to your gradually emerging pate. You, obviously, subscribe to the same coffee-making and drinking philosophy that my sister does (save she never ever ever adds decaf to hers). I am unable to drink her coffee, even with additives, and I normally drink my coffee black; however, it is the FIRST thing I must have in the morning before I can even contemplate anything else. Fergus has learned to wait patiently for his breakfast and trip to the outdoors. Thanks for the intro to Marcus King! Your dog is a gem! What a positive, life-affirming fellow you are sir! I’ll check out your new band shortly. I normally try to limit myself to a single good belt of caffeine in the afternoon, when my energy levels at work start to flag, although in Spain, there’s nary a meal goes by without a cafe solo – their espresso. Keep that Joe flowing! PS a tight rhythm section, a saxophone, great keys, and a front man that can play a cherry red Gibson up to its design capabilities – what’s not to like? Thanks for the introduction! I hope to be at the band’s show when they pass thru Philly next month. An awful lot of bands these days don’t use, or barely use, electric guitars. But this band is trying to keep the electric guitar alive. Marcus can really play that thing. I gave up coffee years ago but just couldn’t resist trying the coffee in Montreal and that was all she wrote. Now I’m hooked again. I like the band – very energetic. Thanks for the videos! The Marcus King Band is very good. As for morning routines, they are wonderful…especially when we have the house all to ourselves and don’t have to face the demands of the day quite yet. I don’t drink coffee, but a morning glass of Diet Coke always makes me happy. You have a good idea there. That’s a delicious drink! Your morning routine sounds wonderful, things are slightly more hectic here. And you’ve got me trying to figure out how I can have a cup of chai ready for me when I get into the kitchen each morning! Hello Annika. Yes, the timer on my coffee brewer has become a pal of mine. I never used the timer until a year ago. Glad I decided to give it a shot. Thanks for stopping by. I appreciate it. Just added Marcus to the playlist. Good stuff. I kissed a guy on the head once. ‘m not ashamed to admit it. CB, keep your eyes open for Marcus. Maybe his tour will bring him to your area. I’m reading this with my early morning coffee and am having a good chuckle. Yes, this time of the day before everything gets going is nice. Hi. Morning coffee in a peaceful atmosphere is hard to beat. Thanks for dropping by. Enjoy the rest of the day! I have to say, I was gobsmacked when I realized that all coffee doesn’t taste like generic brew. I now drink only Arbuckles (brew of the old West, comes with a peppermint stick) because it is so darn smooth. I like the blending suggestion. When I get tired of the version I’m on now, I think I’ll try that. Hi. I was at a throughway service plaza yesterday. It didn’t have a Starbucks, so I got coffee from Dunkin Donuts. It was dishwater! Have a great weekend, Jacqui. Try as I might, I am unable to leave a like on your post, something is up either with your account, or with mine. I am trying these lines as a test, not sure I can submit them. Hi there. Your comments arrived. WordPress can be glitchy. My stats page was acting all weird today, for instance. I hope it heals! Thank you, Neil. So far, no luck. I sent an e-mail to WP to ask for help, I hope they can figure out what is wrong. Yeah, Allmanish for sure. Maybe I should apply for a roadie job with Marcus? COFFEE! Where’s mine? I’m addicted to the stuff. Morning without coffee would be worse than being locked up in the slammer. Tea? Forget it. Cheers. I didn’t start drinking coffee till I was around 30. But for the last 40 or so years I’ve been hooked. See ya, Muriel. Yes. and don’t forget the three remaining strands of hair on the top of my head. Or is it four? How I admire ANYONE who does Sudoku. My hubby– the physicist– does them in ink! Showoff….and I right? Alas, for me, It hurts my brain too much to even spell the word. All the java in the world (and I drink espresso…black…first thing in the a.m.) doesn’t seem to help fire up those brain cells for logic-based puzzles. Thankfully I fare better with crossword puzzles so I don’t feel like a complete dolt. Love your joy in ‘the little things’. They are truly what makes life sweet. As the saying goes “Enjoy the little things in life, for someday you will realize they are the ‘big’ things”. If you ever need stronger coffee, I saw this brand in a Vermont country store: Wake the F#$* Up! coffee (except really written out). Debra, that sounds like my kind of coffee. I knew I could count on you! Wow Neil, we must be on the same Northeast wavelength–the connoisseur coffee mix to start the day (though I start it two hours later–further north, you know), the brainteasing puzzle–Ed and I do the London Times cryptic crossword together every morning over breakfast. And music–who can even think of functioning without tunes? Great minds, you know, approach the morning alike, though I do have rather more than three hairs (knock wood!). Top of the morning to you! You know, I like crossword puzzles. I attempt a few each week. But I became hooked on sudoku in 2011. There’s something about trying to figure out which number goes into each blank box. Anyway, we’re keeping our brain cells lubricated by doing puzzles of any sort. Have an excellent day, Amy. Bye till next time. Hi John. Scrabble is terrific. It’s a lot of fun, and sometimes very frustrating! Thanks for the visit. See ya. Thank you for your public service announcements! 🙂 I’m one for morning coffee and peace, too. I love using pre-dawn time to drink coffee and catch up on other writers’ sites while setting up my own marketing posts for the day. If one of my kids–usually Bash–gets up early, my WHOLE rhythm gets knocked on its side, and I’m a crank all day. That morning solitude is precious! Thank you ole mixologist of coffee! I’ve actually never thought of mixing my coffee. I’m not sure why, because I’ve mixed sodas, I guess it somehow seemed sacrilege. I shall try it and report my findings. Depends on my mood I’ll either drink coffee or tea in the mornings. 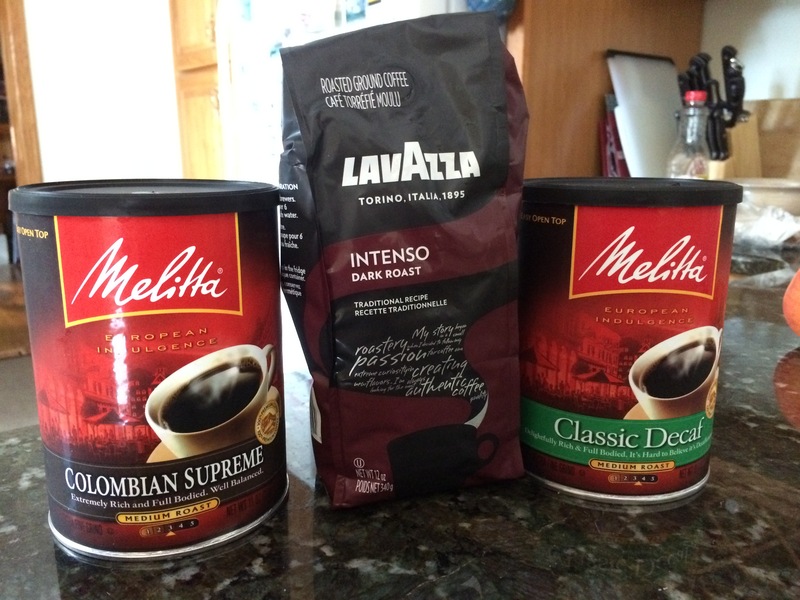 I’m impressed with the different coffee mixes. I’m gonna try it out! Hi there. I think you’ll like the results. Many thanks for adding your thoughts. I appreciate that a lot. Thanks for stopping by, Cathy. I’ve always stuck to the original version of sudoku. I should do what you do — i.e. 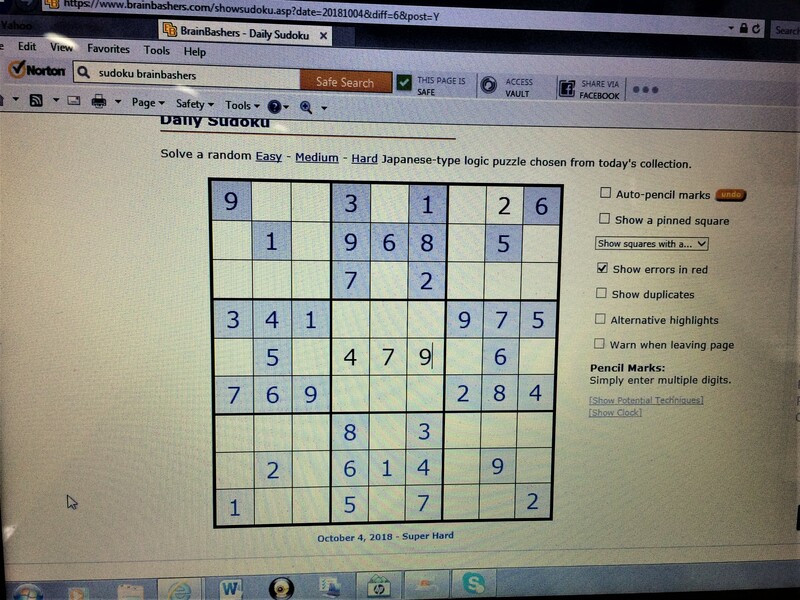 try different varieties of sudoku. I refer you to my experience of puzzles at https://cathy-cade.com/2018/09/07/puzzling-it-out/ . I’m reading your post while drinking my morning cup of coffee !! I gotta say that those songs you shared gave me good vibes ! I like that kind of music so i’m glad i stopped by your blog this morning !! thank youu !! My pleasure. They’re a good band. yes they are .. I liked the feeling that the singer performes with. 1- The exchange between you, Sandy, and your three (questionably 4) strands of hair made me smile. 2- To wake up at 6:30am has been a long term goal of mine. I admire you… from my bed fast asleep. 3- Great recommendation about the band. Thank you! Hi. In only a few weeks the band will be rolling thru Philly. I plan to be at the show. See ya. Coffee and my taste buds tend to have violent disagreements, ergo my drug of choice is good strong black tea. Sudoku also provides me with morning mental calisthenics, whether it prevents atrophy of the old grey matter is questionable, but I like to think it helps. I use an Android app called Sudoku 10,000 Plus, it has a wealth of whatever level of difficulty or help you could hope for. I’m a tea drinker, but I still enjoyed your morning ritual story. Oh, and I bet you have more than 3 hairs on your head. My husband is the same; has been asking me if he has a bald spot for 30 years. Keep writing! Hi Linda. I’m always glad to hear from you. Many thanks for adding your thoughts and observations. How many hairs are on my head? — it’s a secret! My coffee combining experiments have been rather disastrous. I was given some strong but not delicious coffee and it just blasts though everything I make. I have been mixing it mostly because I want it gone, but am, obviously, too cheap to through it out.